High-kicking Broadway show tunes. World-class museums. Shopping on Fifth Avenue. Some of the tallest skyscrapers on the planet. Superlative cuisine – and cocktails. It’s no surprise that New York is one of the most visited cities in the world. For my 4th visit to NYC I had little more than two days to tackle the city. My goal was to focus on revisiting my favourite attractions while checking out what’s new. I researched my trip weeks in advance using Eyewitness Travel Top 10 New York City (DK Publishing, 2016), sketching out an itinerary which would have me zipping through the “city that never sleeps,” with ease while finding time to take in top attractions and nibble through famed local delicacies. My goal was to gage how much one can see if they only have a weekend away or short layover while en route to Point B. I made the most of my time by clustering activities (uptown Day 1, downtown Day 2) so I wasn’t wasting time needlessly schlepping myself across Manhattan. Remember, the early bird really does get the worm! So why not slide into your comfiest shoes, sling a camera around your back and brace yourself for a dawn till dusk urban adventure in the home sweet home of Lady Liberty? Includes Map: in the books back pocket you’ll find a detachable waterproof map which comes in handy when you find yourself lost on the subway. 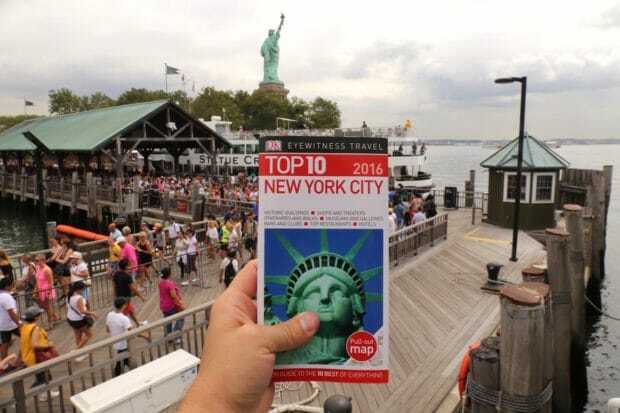 Great Top 10 Lists: the first few chapters of the book are dedicated to the Top 10 most visited attractions in New York City while the remaining are niche lists which are handy for those who have unique interests. Examples include Skyscrapers, Off the Beaten Path and Figures in History. Insider Tips: the guide is full of useful insider tips and tricks which answer a lot of great questions you might not even think to ask. Be sure to grab a CityPASS if you’re planning on tackling the city’s top attractions as you’ll save money and often avoid waiting in line. Tucked between SoHo and the Hudson, Hotel Hugo is a stylish and sophisticated member of Manhattan’s emerging West SoHo neighbourhood. 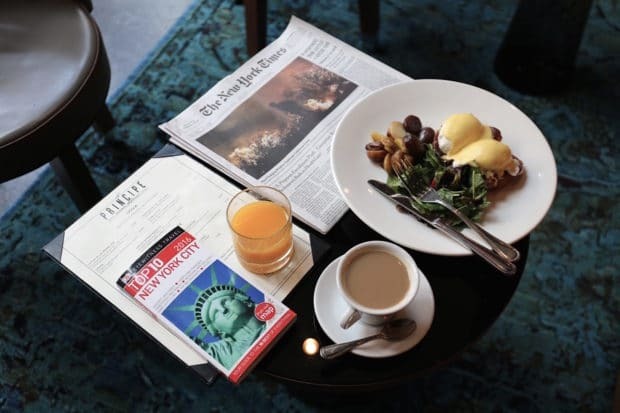 This show-stopping hotel exudes the contemporary luxury and bohemian chic that make Lower Manhattan a modern-day mecca for artists, publishers and design enthusiasts. Designed by renowned architect Marcello Pozzi, this elegant yet altogether approachable retreat draws inspiration from the area’s art-meets-industrial atmosphere, effortlessly blending raw materials with modern finishes to create environments that evoke both trend and tradition. Whether you’re sipping a cocktail at the hotel’s sparkling glass-enclosed rooftop bar (try their Cuban inspired eats at sunset please) or savouring authentic Italian comfort cuisine in the stunning Il Principe (may I suggest snagging a spot on the breezy street-side al fresco patio at breakfast? ), Manhattan’s darling boutique hotel has a style and spirit all its own. 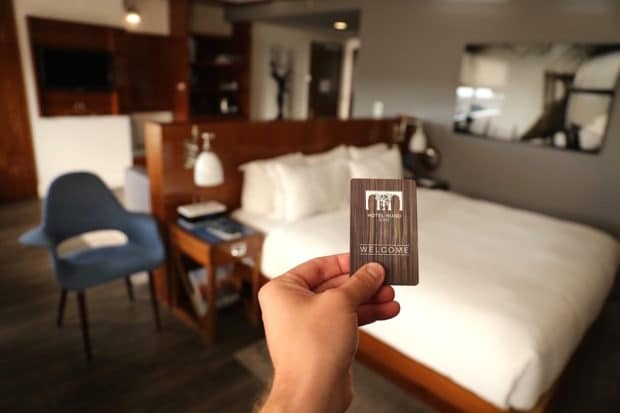 Hotel Hugo’s 122 guest rooms and suites exude a bygone era of industrial style. Custom wood furnishings and retro industrial chic light fixtures, combined with playful colours and eclectic accents, form residential spaces that blur the lines between hotel and home. Luxurious bathrooms are crafted of custom Italian tile work and feature rain showers, rich terry robes and hydrating bath amenities by Argan Source. On the average day most visitors to NYC find themselves marching around Manhattan, snapping photos of breezy Central Park, jaw-dropping at the MET’s marvellous art and sliding slowly up the spiral staircase at Frank Lloyd Wright’s iconic Guggenheim. When you find yourself hobbling along the street with sore feet, don’t fret. 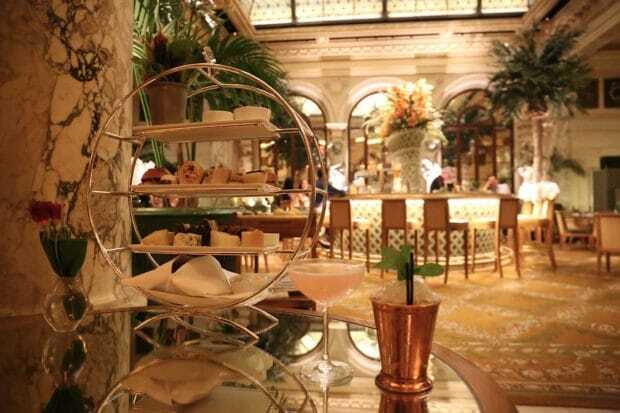 Instead spend an afternoon and eve skipping from one luxury hotel cocktail bar to the next. Rest your feet on plush pillows while nibbling on epicurean delights, quenching your thirst on freshly muddled marvels. The Empire State Building is the most famous skyscraper in New York. 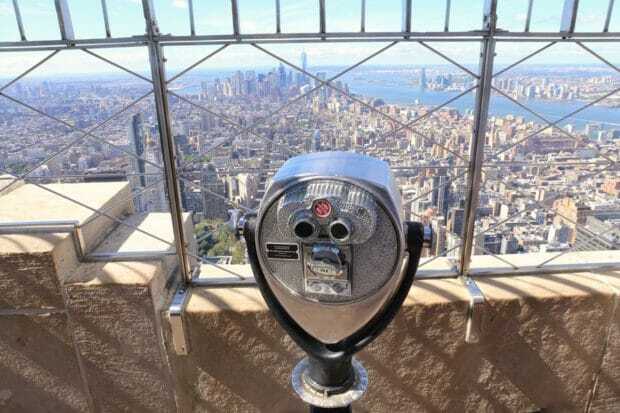 More than 120 million visitors, including such luminaries as Queen Elizabeth II, have gazed down on the city from the observatories since it opened in 1931. Planned in the prosperous 1920s, the Art Deco classic was completed during the Depression and was largely vacant for several years, giving rise to the nickname “Empty State Building.” It has been featured in countless movies, most famously King Kong. The views up top on a sunny day are unforgettable. Lindy’s is one of NYC’s most famous restaurants and worthy of a pilgrimage if you suffer from a sweet tooth. Originally opened in 1921 on Broadway, the popular spot became best known for its cheesecake, which many claim was invented here. 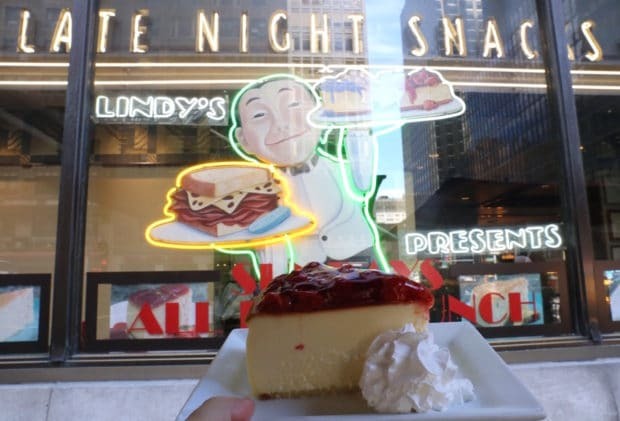 Lindy’s cheesecake was immortalized in the film Guys and Dolls, when Nathan Detroit and Sky Masterson sang its praises. You’ll be in heaven after slowly forking through a creamy thick slice topped with cherries and whisper of whipped cream. Few city children grow up without visiting the dinosaurs, the life-size dioramas of animal life, and natural wonders in this popular museum. Since its founding in 1869, the American Museum of Natural History has grown to 46 permanent exhibition halls spanning 4 city blocks. Holdings include 32 million specimens and cultural artifacts, many unique in the world. Be sure to check out The Milstein Hall of Ocean Life which explores the waters of the earth and their inhabitants. 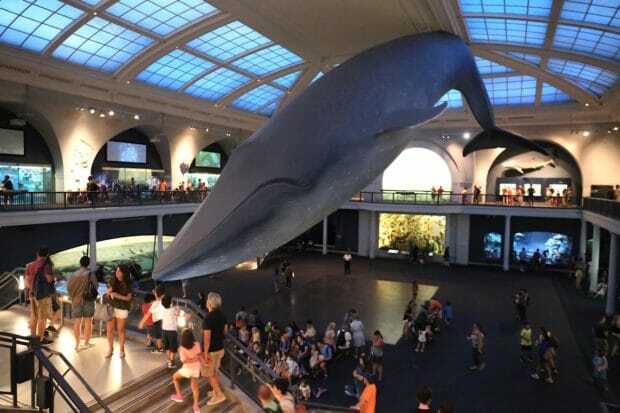 A 94-ft life-size blue whale hanging from the ceiling forces a jaw-drop. New York’s “backyard,” an 843-acre swathe of green, provides recreation and beauty for around 38 million visitors a year. Designed by Frederick Law Olmsted and Calvert Vaux in 1858, Central Park took 16 years to create and involved the hauling in of vast amounts of stone and earth to form hills, lakes, and meadows, the planting of over 500,000 trees and shrubs, and the building of more than 30 bridges and arches. 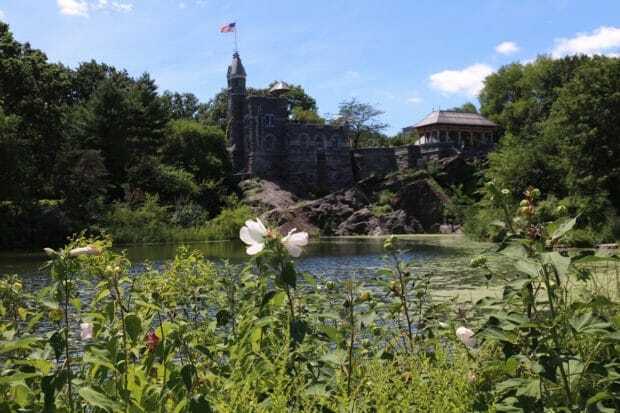 Stroll past gorgeous gardens and look out over a pretty pond and you’ll find Belvedere Castle, a 19th-century stone castle which offers peerless views in all directions. Inside is the Henry Luce Nature Observatory with exhibits covering the park’s diverse wildlife. Throughout their years living in New York City, Douglas Quint and Bryan Petroff had always focused on their respective careers — until they got themselves a Big Gay Ice Cream Truck. Their seasonal truck debuted in June 2009, and since then, the business has seen a whirlwind of publicity and has become a NYC must-try. 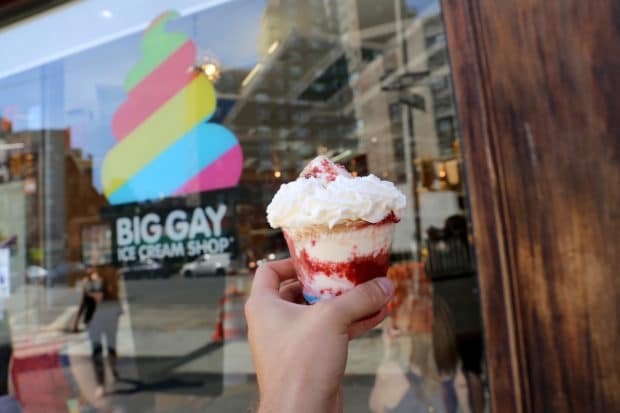 The first Big Gay Ice Cream Shop opened in September 2011 in the East Village. With a playful attitude, Big Gay Ice Cream spins a new take on old-school soft-serve by creating fun and unique ice creams, toppings, and frozen treats with hilarious names such as Bea Arthur (dulce de leche, crushed nilla wafers), Mermaid (key lime curds, crushed graham crackers, whipped cream) and American Globs (pretzel, sea salt, chocolate dip). 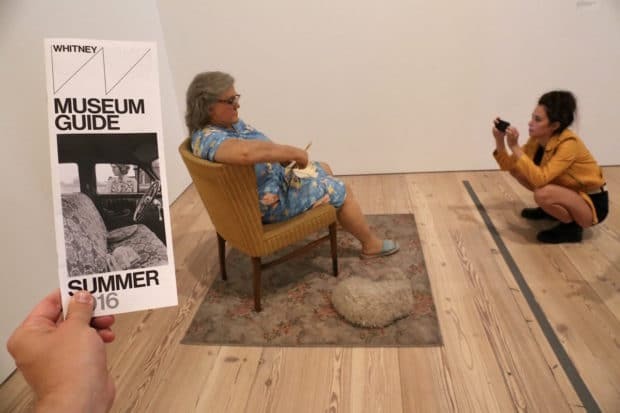 As the preeminent institution devoted to the art of the United States, the Whitney Museum of American Art presents the full range of twentieth-century and contemporary American art, with a special focus on works by living artists. The Whitney is dedicated to collecting, preserving, interpreting, and exhibiting American art, and its collection—arguably the finest holding of twentieth-century American art in the world—is the Museum’s key resource. Innovation has been a hallmark of the Whitney since its beginnings. It was the first museum dedicated to the work of living American artists, consistently purchasing works within the year they were created, often well before the artists became broadly recognized. 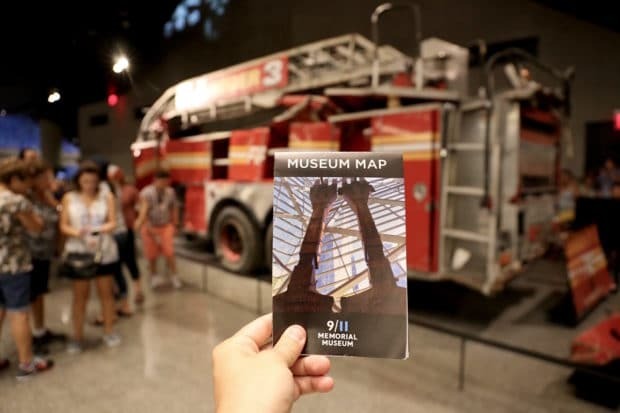 The 9/11 Memorial Museum serves as America’s principal institution concerned with exploring the implications of the events of 9/11, documenting the impact of those events and exploring 9/11’s continuing significance. I was amazed that one of the city’s busiest attractions offered guests a truly quiet space for a moment of reflection. Examples of the Museum’s holdings include salvaged remnants of the World Trade Centre buildings, personal effects and memorabilia, expressions of tribute and remembrance, and artifacts, archives, oral histories, moving images, and photographs related to the history of the World Trade Center, the events of September 11, 2001 and February 26, 1993, and the repercussions of these horrific attacks. New York’s most famous statue, officially titled “Liberty Enlightening the World,” has been a harbinger of freedom for millions since 1886. The statue, a gift from France to mark the US’s 100th birthday, was designed by the Frenchman Frederic-Auguste Bartholdi, who devoted 21 years to the project. The unveiling on July 3, 1986 after her $100-million centennial restoration, was the occasion for one of the largest firework displays ever seen in the US. 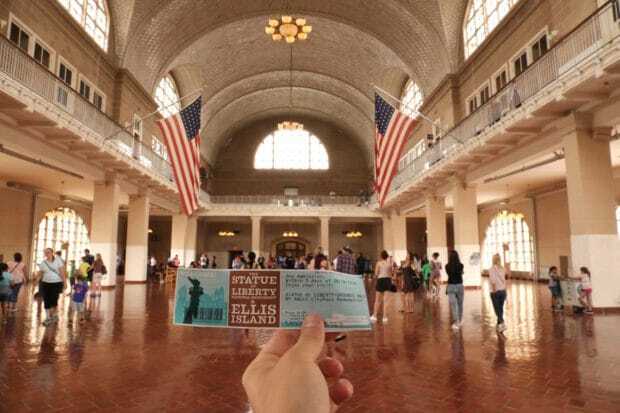 Ellis Island is the symbol of America’s immigrant heritage. From 1892 to 1954, it was the arrival point for over 12 million people searching for a better life. Their descendants, more than 100 million people, comprise almost 40% of today’s population. First and second class passengers were processed for immigration on board ship, but the poor traveling in steerage class were ferried to the crowded island for medical and legal checks. As many as 5,000 passed through in a day. The museum not only retraces their experience here, but is a complete picture of the immigrant experience in America. If you’re a fan of Jew Food and looking to nosh on Manhattan’s finest Kosher eats be sure to pop by the iconic 2nd Ave Deli. 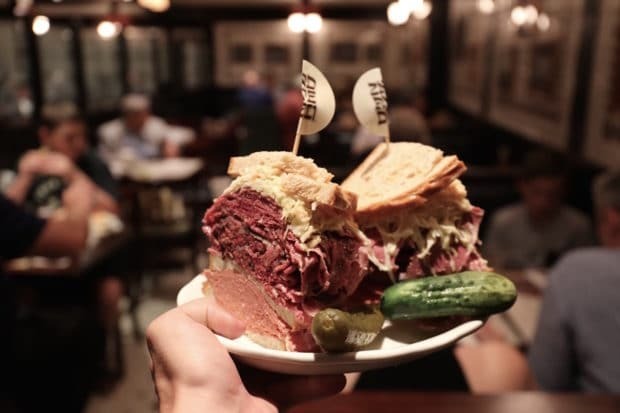 Originally opened in 1954, this New York City favourite is famed for its matzoh-ball soup, corned beef, knishes and gefilte fish. May I suggest tackling the triple decker pastrami and smoked meat sandwich paired with a crunchy pickle duo? Order the latke’s with sour cream and apple sauce if you dare…they’re almost twice the size of hockey pucks! New York’s culinary scene always turns heads as entrepreneurs here take risks and set the stage for food trends which are often adopted and tweaked by inspired foodies from Toronto to Tokyo. I simply adore everything about the City Winery concept, crafted for those who are passionate in sharing wine, music, and culinary arts. The unique facility in SoHo, combines a fully functioning urban winery with intimate concerts, food & wine classes and fine dining. 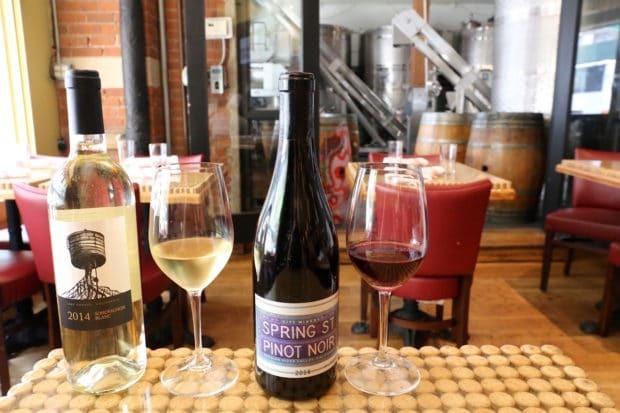 The City Winery team have created a compelling mix for a sophisticated clientele of foodies, and active cultural patrons—bringing the wine country experience to the middle of a bustling city. Pop by for a tour of the winery in the late afternoon, sip a few glasses of vino at the intimate wine bar and spend the evening feasting on an Americana-inspired menu while watching your favourite band perform live in one of the most intimate (and tastiest) venues in NYC. One of the great architectural achievements of the 20th century, Frank Lloyd Wright’s 1959 spiral design alone would make this museum a must. 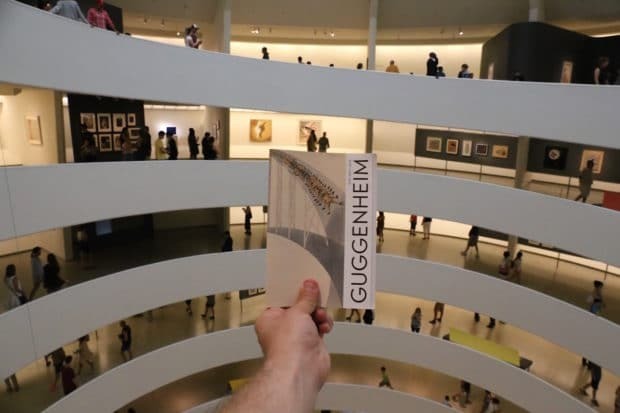 The Guggenheim’s core collection of Abstract art has been widened by donations of several important collections. The museum owns a host of work by Gauguin, Chagall, Kandinsky, van Gogh and Picasso. Only a small portion is on show as the main gallery is used for temporary exhibitions. 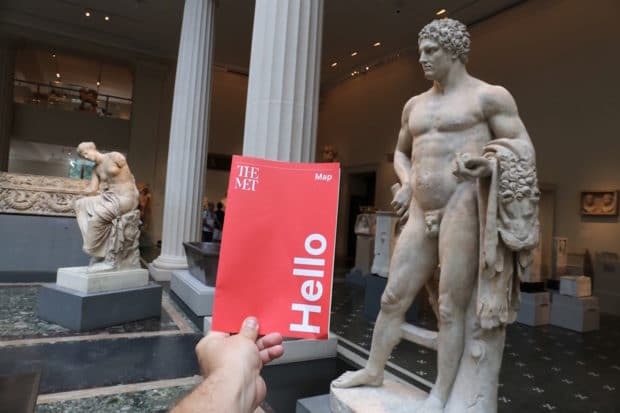 One of the world’s great art museums, the Metropolitan (MET) spans 5,000 years of culture from across the globe. Each specialized gallery holds an abundance of treasures. Founded in 1870 with three European collections and 174 paintings, the Gothic Revival building has been expanded many times and the present holdings number over 2 million. As you may have heard, Vogue’s Anna Wintour throws a little ball here each year. Add that one to your life goals.